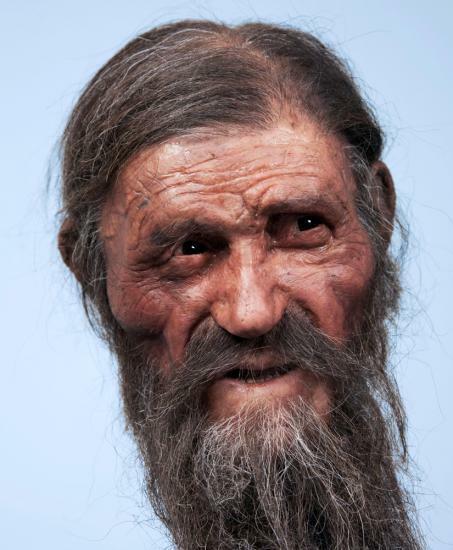 Brown-eyed, bearded, furrow faced, and tired: this is how Ötzi the Iceman might have looked, according to the latest reconstruction based on 20 years of research and investigations. Realized by two Dutch experts, Alfons and Adrie Kennis, the model was produced with the latest in forensic mapping technology that uses three-dimensional images of the mummy's skull as well as infrared and tomographic images. The new reconstruction shows a prematurely old man, with deep-set eyes, sunken cheeks, a furrowed face and ungroomed beard and hair. Although he looks tired, Ötzi has vivid brown eyes. Indeed, recent research on the 5,300-year-old mummy has shown that the Stone Age man did not have blue eyes as previously thought. Believed to have died around the age of 45, Ötzi was about 1.60 meters (5 foot, 3 inches) tall and weighed 50 kilograms (110 pounds). The model will go on display beginning March 1 to Jan. 15, 2012, at the South Tyrol Museum of Archaeology in Bolzano, Italy. Called "Ötzi 20," the exhibition celebrates the 20th anniversary of the mummy’s discovery. The Iceman’s frozen body was found in a melting glacier in the Ötzal Alps -- hence the Ötzi name -- on Sept. 19, 1991.